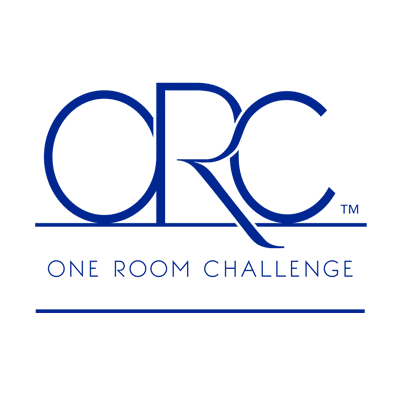 I’m so excited…and maybe a little nervous, to be joining in on the One Room Challenge as a guest participant. I’ve been thinking about re-doing a lot of my main floor living area for quite a while. We moved in here about ten years ago. It feels like time for a little update, some repainting, and some lighter colours. I’ve loved our cozy, neutral main floor, but lately I’ve been falling hard for the rustic Scandinavian look. I’d like to lighten things up around here and go even more neutral with white walls, white painted furniture, and some rustic wood. You can check out some of my inspiration over at my Pinterest board. 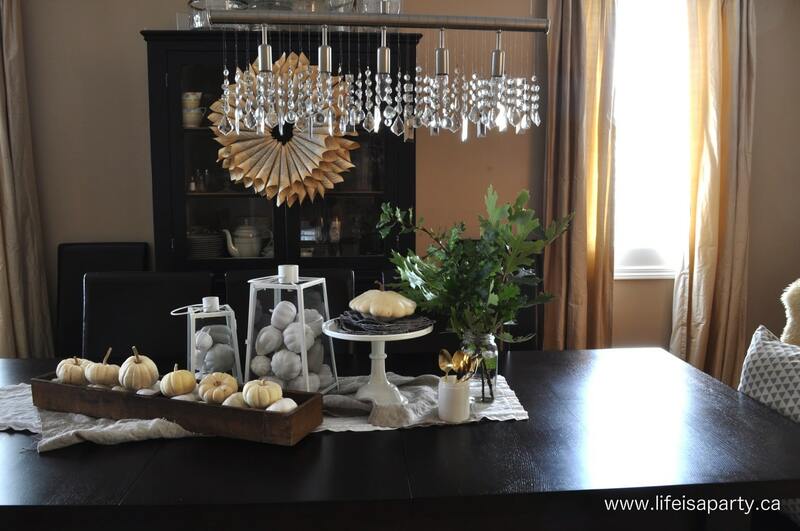 Since I just shared the dining room as part of the fall home tour, here’s a little reminder of what we’re starting out with. I’m planning to keep a few elements like our raw silk drapes -which were a real investment piece years ago, and the chandelier. For our leather parsons chairs, I’m hoping to slipcover them in white, or off-white. I’m not sure if I’ll be able to find something that fits perfectly or if I’ll be sewing all ten. We’ll see how I go. I’m still not 100% sure about the furniture pieces. The largest decision is the dining room table. Right now we have a large extension table in a dark wood finish -it’s veneer so I’m not too sure about re-finishing it to something lighter. I have considered painting it white. I’m still not completely sure. It has really clean lines, and I might like something more rustic like an antique harvest table. I’ve been watching kijiji on and off for months, but a nine or ten foot long antique table seems to be proving hard to find. 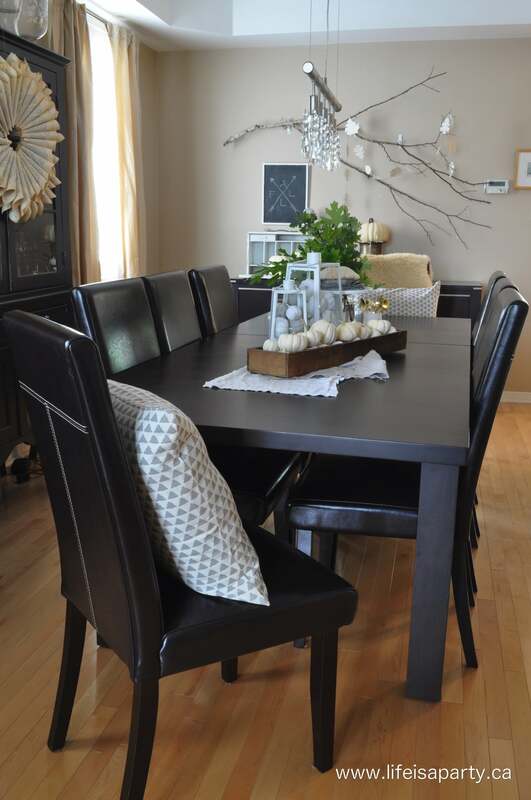 I don’t want to settle for something that’s too short, and doesn’t work for big parties and family gatherings, since that’s the main time we use this table. I’d prefer to get an antique than a new one, since antiques seem to hold their value and if I want to change it again in the future I might be able to re-sell it. If I am able to find an antique one that is long enough, this table will probably move down to our basement family room and be used for a homework table/desk. I have also thought about keeping it as is -since rustic Scandinavian rooms often have a bit of black in them. We’ll see how this unfolds. In the room there is also a large pine antique china cabinet that was my Grandmothers. When we moved to this house ten years ago, I painted it black to match the other new furniture. I’m thinking about stripping and refinishing it, since I’d definitely like some wood in the room. Or, if I find my antique harvest table it might be the wood element in the room, and I might paint this piece white. Either way, it needs a good clearing out, as it’s stuffed top and bottom right now and I’d love to use it more for display than storage in the future, and change it seasonally. 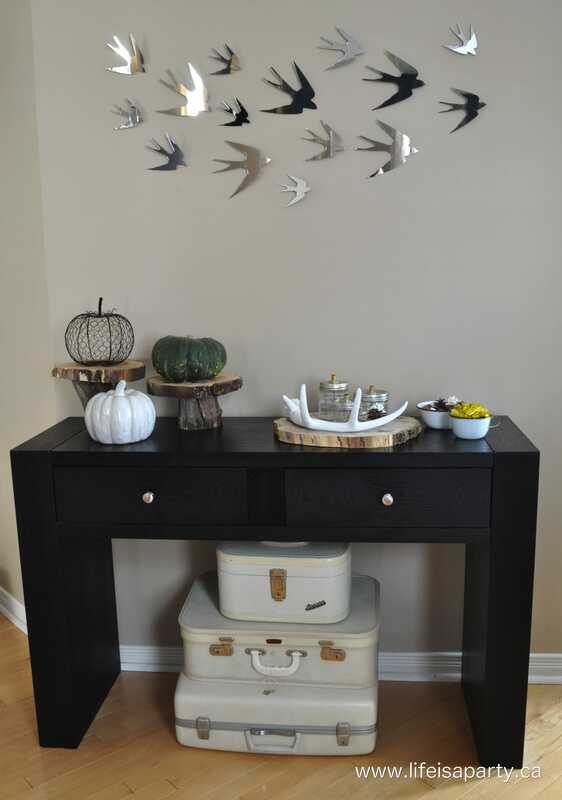 The other pieces in the room are a black console table by the front door, that I’m planning to paint white and possibly change the hardware. I’d love to add in some brass, but the light is silver and I’m keeping it so maybe I’m stuck with silver. The final piece is the buffet. I love having this long and low piece at the end of the room. 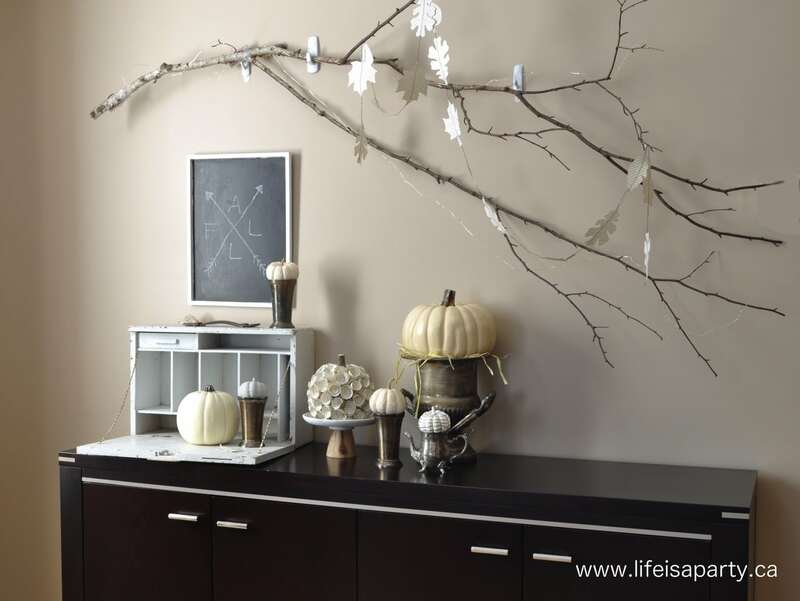 It works great for entertaining there, and is often a buffet for food, or a pretty dessert table. It’s very contemporary. I originally thought I should look for an antique piece for there and paint it white. I’m considering keeping it though, since Scandinavian design is often very clean lined and mixes that with antiques. Of course it’s cheaper to paint it, so perhaps I’ll give it a try. Those are the major changes I have planned. Perhaps some new art, or a gallery wall too. I’ve thought about a rug to add texture, but love the convenience of the plain hardwood, so I think we’ll leave it. I definitely am nervous going in to this. I do like the dining room as it is, and have liked it the last ten years, but I think I would like it more in whites. You can tell from the styling of the home tour that I’m loving this rustic Scandinavian look more and more, it’d be great if the furniture in the room reflected that too. I don’t have a huge budget to do this room, so it’s mostly going to be make-overs and second hand purchases. While I am a little nervous, and thoughts of ruining what’s already there have certainly crossed my mind, I am also more and more determined to surround myself with beautiful things that I love. I had a major clear out in the basement this summer -with more to go and I tried to let go of everything that I didn’t love anymore. My storage room had more than a few pieces that I was hanging onto for sentimental reasons, or because of how much I’d spent on them. Re-doing the dining room is partly about being brave enough to let go of the good enough in pursuit of the better. With a major make-over in the works for the next six weeks, life really is a party! 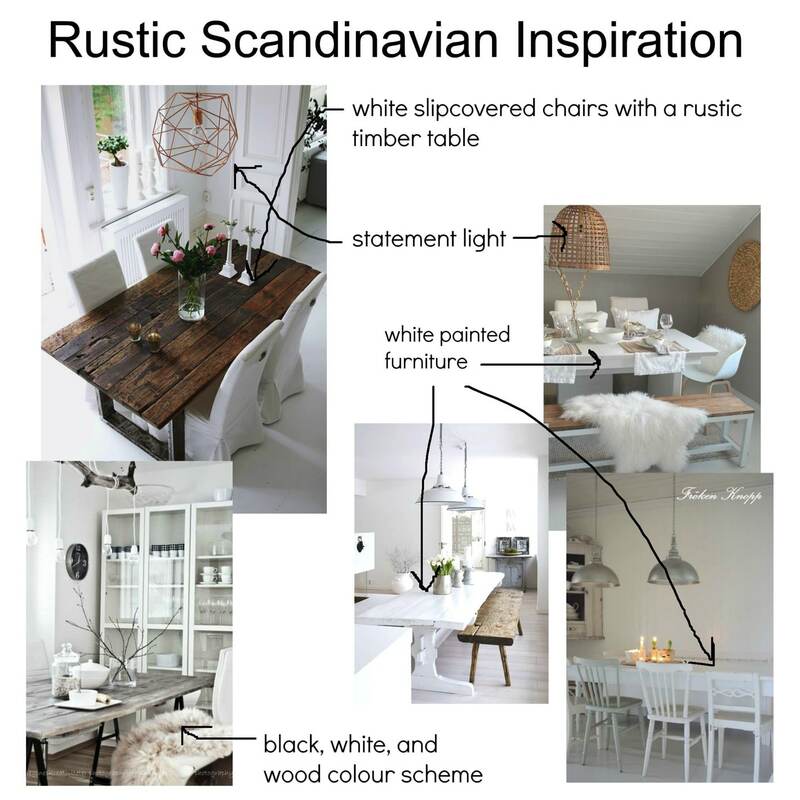 I love the idea of rustic scandi for this space! I think it will lead into the natural wood fireplace beautifully! Oooooh! So pretty! I love that chic Scandinavian inspiration!! Good luck with all your projects, and happy Thanksgiving weekend! it is going to look so pretty, I saw you already made your slipcover, very nice.